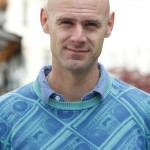 One of the main aims of the Urban Agenda for the EU is to improve the knowledge base and the collection of comparable and reliable data on urban development issues – this would in turn facilitate the monitoring and benchmarking of European cities, and foster the engagement of citizens in urban related debates. In this frame, the European Commission has developed the Urban Data Platform which provides a single access point to common indicators on the status and trends of more than 800 cities in Europe. The Urban Data Platform (UDP) is a joint initiative of the Directorate-General Joint Research Centre (DG-JRC) and of the Directorate-General for Regional and Urban Policy (DG-REGIO). Launched during the European Week of Regions and Cities in October 2016, it has been further presented at the UN Habitat III Conference in Quito, as part of the EU contribution to the Sustainable Development Goals and towards the global Urban Agenda. 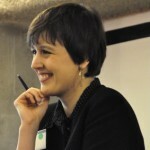 What is the Urban Data Platform? The web portal is an interactive interface that allows users to explore, visualize, compare and download data. 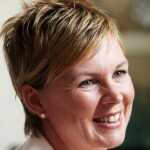 It aims to give a complete and consistent picture of the state and trends (i.e. 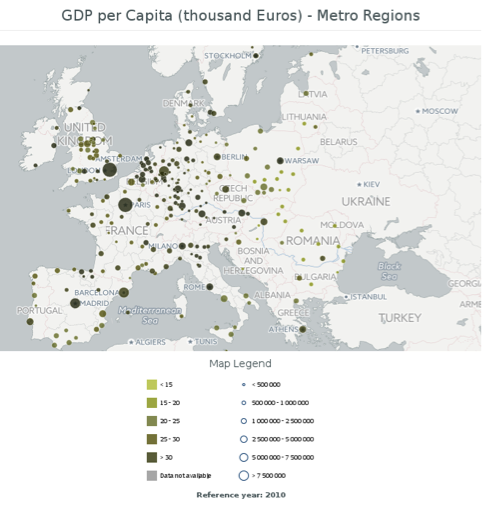 past and future) of European cities using interactive and visual tools to present and analyse the data. The platform collects open data derived from multiple sources, including the JRC, DG-REGIO and EUROSTAT. Several available indicators were used in the EC/UN-Habitat Cities’ Report. Social Issues – a wide range of topics, mostly indicators provided by the Composite Indicator Research Group (COIN) at the JRC, relating to education, risk of poverty, material deprivation, physical security and crime, residential overcrowding and share of tenants, work intensity and social exclusion risk. The available data can be visualized in the portal by selecting the desired indicator (from the thematic areas drop-down menu) and reporting unit. The indicator is then displayed on a pan and zoom-able map, as well as in the form of automatically generated charts. The diagram below gives the main functionalities available. The data can also be compared (and ranked) at the city level in a list, which is searchable and also allows the selection or de-selection of cities. Capital cities can also be singled out. Both maps and charts can be downloaded and shared, and there is a tab giving further information on each indicator. Maps of each indicator can be downloaded as they are presented on the web browser in either PNG (image) or PDF format. The legends are automatically generated, with the colour scale giving the range in values of the indicator, and the size of the icon increasing with total population within the urban area. An example is given below showing the GDP per capita for metro regions for the reference year 2010. 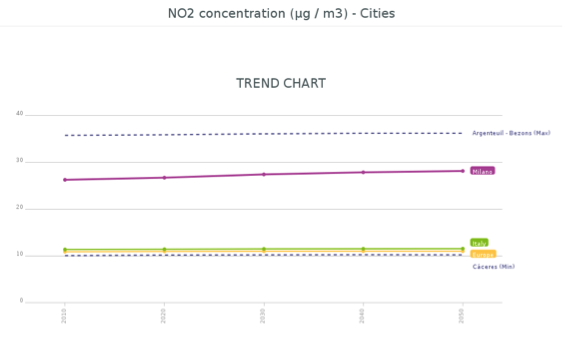 Trend – This chart shows the change in the selected indicator over time for the selected city or region. It also allows comparison with the trend in national and European average, and shows the cities/regions with the highest and lowest values of that indicator over time. For example, looking at NO2 concentration in cities, although both the Italian and European average concentrations are foreseen to remain quite stable and relatively low, the values for Milan are far higher already in 2010, and are expected to increase steadily by 2050. This would be a good indication of the need to further improve the effectiveness of local measures to reduce air pollution. 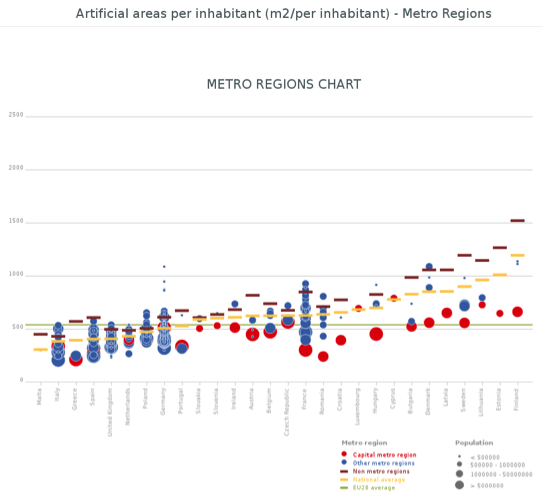 Metro regions – This chart gives indicator values for all types of metro regions (differentiating capital and other metro regions), as well as average values for non-metro regions, national and European averages. The different categories can be turned on and off, and the scale can be manually adjusted. The example given is for the amount of artificial area per inhabitant (m2/person) for the reference year 2010. A wide range of values are seen both across and within countries. The general trend is towards a lower amount of artificial area per inhabitant in larger and capital metro regions, whereas non metro regions have the highest amounts of artificial areas per capita, indicating a more sprawling type of urbanisation. 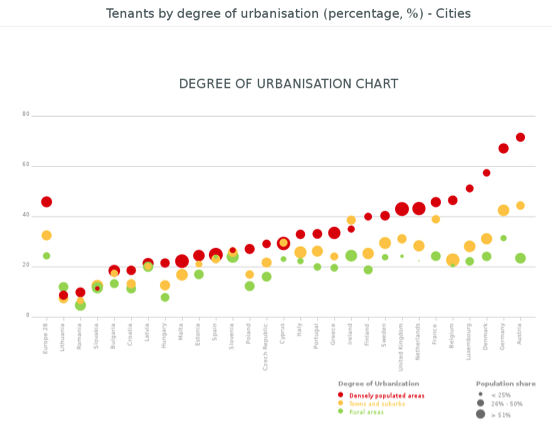 Degree of urbanisation – Here, the selected indicator is shown graphically by degree of urbanisation i.e. comparing the data for densely populated areas, towns and suburbs, and rural areas. The example below gives the percentage of people renting (tenants) in 2014, which can be a good indication of several factors, including cultural aspects, and the state of the housing market e.g. affordability of property. The general trend is towards having the highest number of tenants in densely populated areas, with ownership of an own home in rural areas being much higher. There is also a huge variety of tenant shares per country, for example ranging from only 7% tenant share in Vilnius to 71% in Vienna. The UDF team is keen to see the platform being used by cities across the EU, to support integrated urban development. 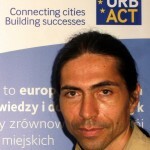 URBACT cities could potentially find the platform of great value in various ways. 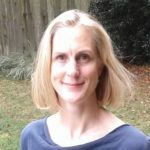 The data available helps cities to establish an evidence base for their action plan and delivery, and to look at future trends to inform future casting. Within URBACT networks the tool could be applied to compare and benchmark partner cities, both in Baseline Studies and in preparing for partner visits. The user-friendly downloadable graphics and charts are easy to insert into presentations to illustrate urban issues and practices. There is support to use the data platform by contacting the UDP team that would be happy to hear from URBACT cities about ways, in which they are using or could see additional potential for the tools. Development of the platform is continuing with the regular up-date, collection, validation and eventual inclusion of data and indicators from new sources as they become available. The functionalities are being further improved and especially the capacity for analysis extended, with the possible inclusion of historical data trends. There will also be efforts to improve data comparability between EU-28 cities and those outside of the EU.